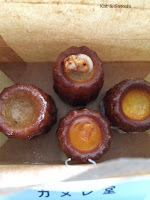 After having my latte at Streamers, I went to Canelé du Japon, as they are just down the street. For winter they have two flavors, hazelnut (top) and secchu-carrot (right). Secchu is literally "in the snow". So this flavor is "carrots in the snow". It's a good thing when you can actually taste what is supposed to be in there like carrots and hazelnuts. 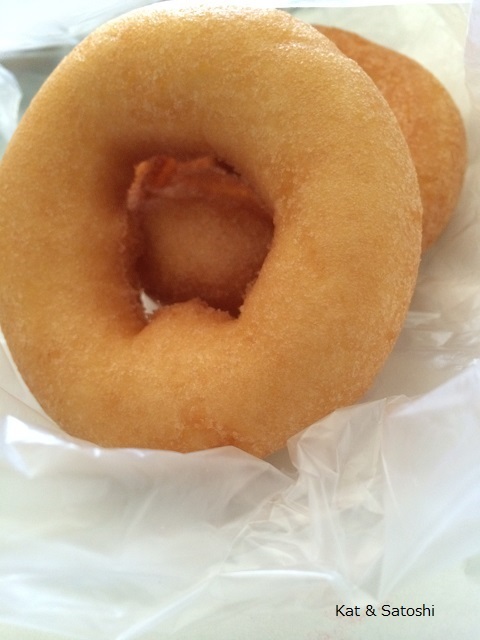 I also got anzu (apricot(bottom)) and kurozato kurumi (black sugar walnut (left)), from their regular line-up of flavors. I'm glad I got to try them again they didn't disappoint. p.s. it's Chinese New Years today, "Kung Hee Fat Choy", if you're celebrating! 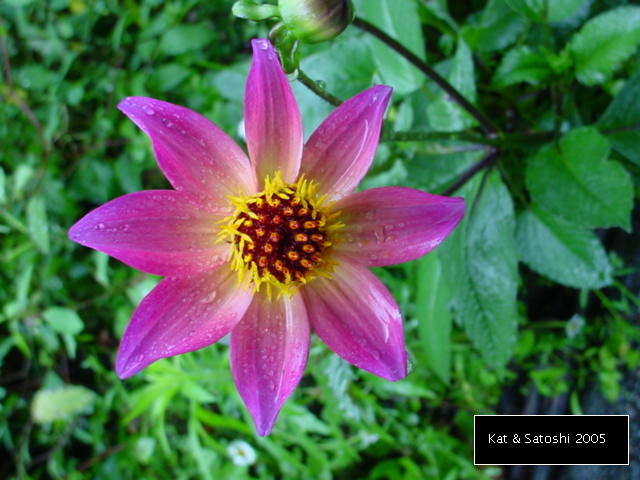 and have a nice weekend. 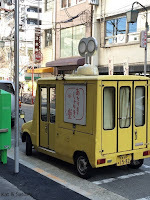 I stumbled across this cute little delivery truck that looked like a wind-up toy. 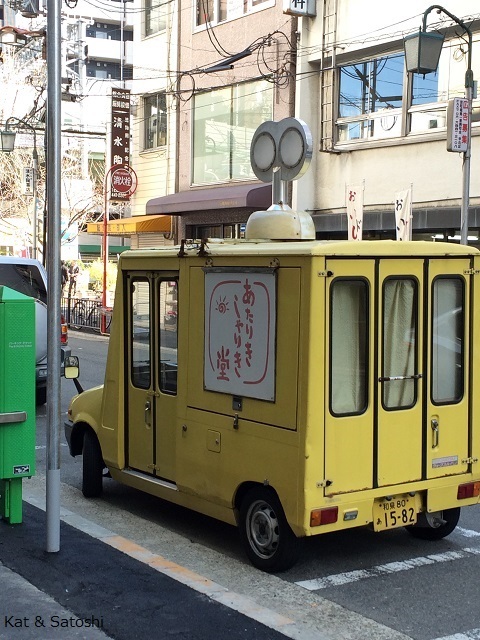 They also have a tiny shop near Utsubo Park. We tried their plain...70 yen each. A bargain, but their doughnuts are a bit on the oily side. I don't know that I would go back but I'm glad we got to try them. 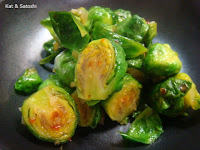 So what did I do with the brussels sprouts that I got from Crazy Pantry?! I used Steamy's recipe for roasted brussels sprouts with sweet chili sauce, here. Only thing I didn't roast them, just sauteed them in a pan with olive oil and added the garlic, sweet chili sauce and fish sauce at the end. Since I didn't take a photo of them the first time, I took one this time around. So good with beer...I'm making this again. I talked about Inaba's curries here, here, and here. Well, they also have gapao...minced chicken with basil and spices. We had this for dinner one night and I served this with some spinach, rice and a sunny-side up egg. I liked this. 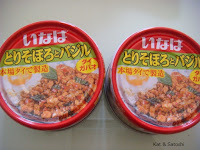 It was really spicy and I like saying the name too...gapao. Friday was such a beautiful day, the temps went all the way up to 13C (55F). I went to Sammy Pooh! for lunch. It was my first time eating there. 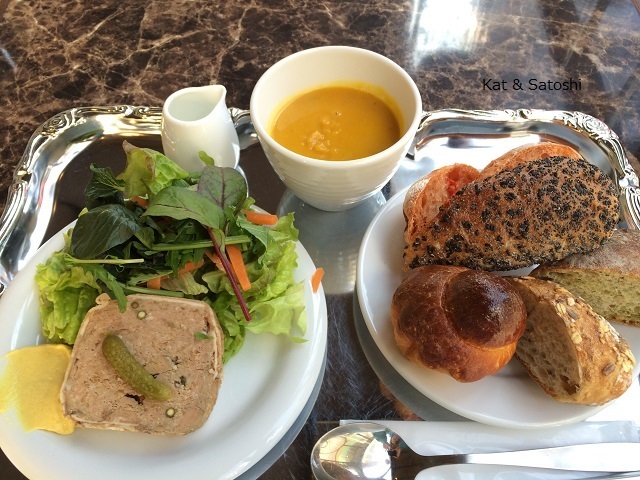 I ordered the pâté lunch...800 yen. This came with a salad, a soup (pumpkin), and LOTS of bread! 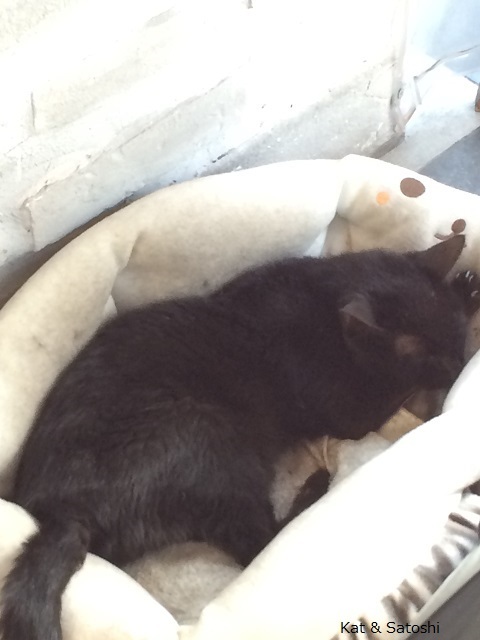 The owner also secretly gave me a cup of kombu-cha (kelp tea)...he said, "shh...only today..."
Their cat was also enjoying the warm temps. I had been wanting to try Streamers Coffee ever since seeing them in a magazine. 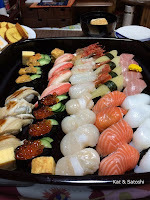 It is more of a takeout rather than sit down type of shop. In fact, it is located at the entrace to a clothing store. They have one leather couch for you to sip your coffee at, still, it was one great cup. I'll definitely be back when I'm in the area. 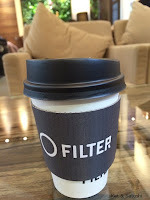 Mille cafe is a Denmark coffee filter made of polypropylene. Supposedly you can use it for 1000 times, so it is supposed to be good for the environment. 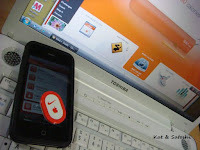 Before using, you need to "season" it by pouring hot water onto it for at least a minute. 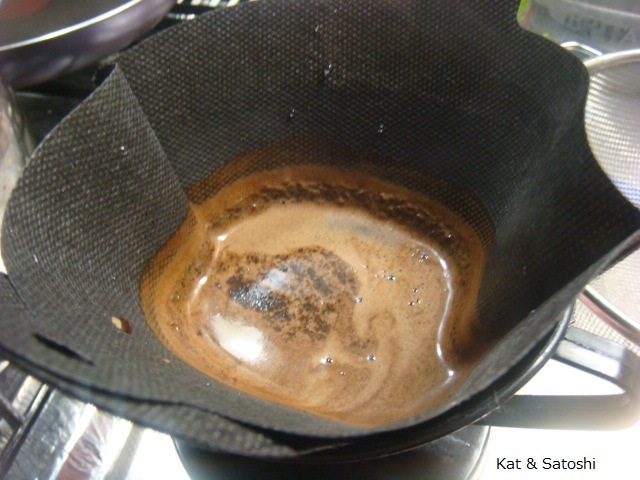 Then after brewing the coffee, you pour more hot water down the filter to wash out the coffee grains. I also washed it with a little detergent after using it the first time because the coffee tasted a little "plastic-y". I wonder if it will really last about 1000 times?! A.C. Perch is a Denmark tea brand. 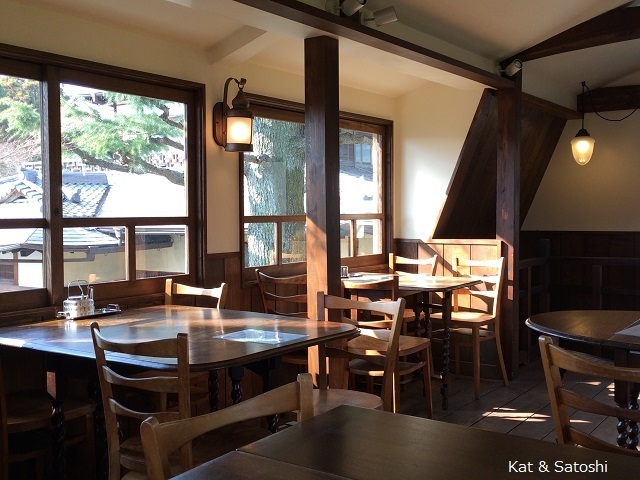 They actually opened a cafe in Osaka last June, but I only I recently learned about it. So this past Tuesday, since I was in the area, I went to check them out. Main dishes are mostly tartines (open faced sandwiches) though they also have hot dogs and other items. 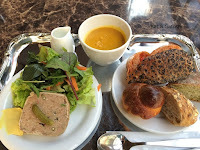 I ordered the scallop and shrimp tartine...1260 yen and also added soup and tea for 315 yen more. The soups they had to choose from were a corn potage, clam chowder or minestrone. I went with minestrone. 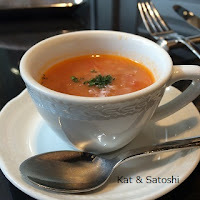 This was thick and sort of reminded me of portuguese bean soup, a soup we eat in Hawaii. My tartine also came with a salad and you could choose between a citrus dressing or an olive dressing. I went with the citrus. 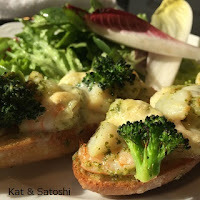 The dressing was really refreshing and went nicely with the seafood tartine. The tartine also had 3 different cheeses on it (I asked...gorgonzola, parmesan and camembert) and a little broccoli...cheesy good! The tea I chose was No. 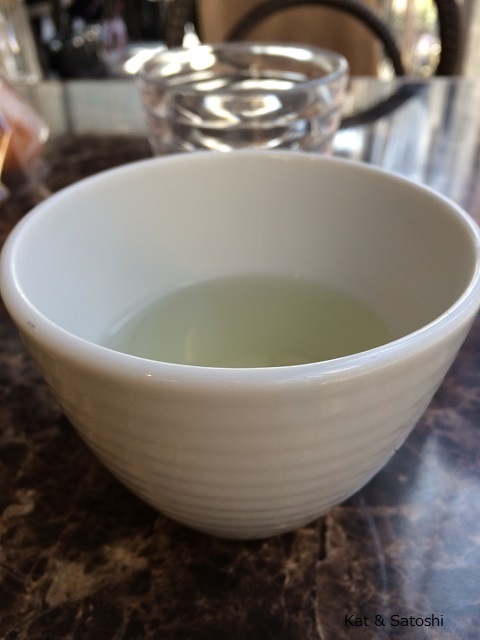 5...Emperor Tea. A Keemun, dark and smoky. I'm glad I tried this place and will definitely be back when I'm in the area. 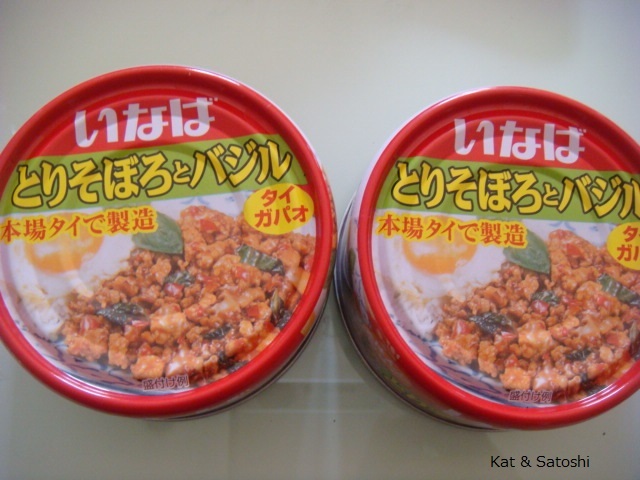 I don't quite remember when I bought this but had put them into my refrigerator so they wouldn't spoil with the awful heat of Osaka's summer. 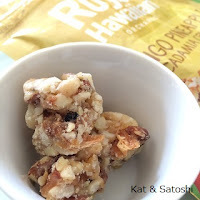 These are "tropical" tasting...lots of pineapple and nuts (mac & almond), kind of like a bite-sized chewy granola bar. A nice thing is that they are "made in Hawaii". I hope to pick up more varieties the next time I'm in Hawaii. 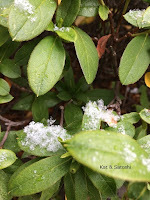 Sunday we finally got some flurries! 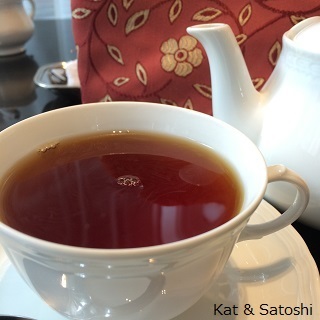 While Satoshi went to his German class, I walked from Umeda to Filter, for breakfast. I ordered their BLT sandwich set...550 yen, this came with a small salad and coffee. I think their bacon was actually pastrami, but it was still delicious. When I got there, a man was just leaving, and after I finished eating, another man stepped in for coffee. With the place so quiet, it kinda irritated me how he would slurp his coffee. Anyway, after using their free wifi and reading some of their coffee/cafe magazines, I went to check out Takamura Wine. A huge warehouse filled with all sorts of wines, coffees and some snacks. This place is actually owned by Marukai. Yup, that Marukai. For those that don't know what Marukai is, it is a popular Japanese import shop in Hawaii and some areas of California. I bought two bottles of wine, I'll post about it when we drink them. And then I started to walk back to Umeda. 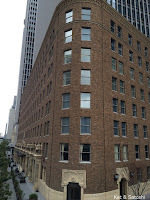 Along the way, the flurries started again and I also stumbled upon this building. Doesn't it look like it should belong in New York or somewhere like that?! 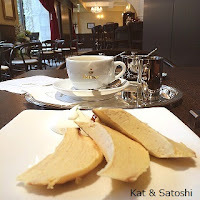 And then I stumbled upon the Dallmayr Cafe (inside the cool building), so I stepped in for a little snack...baum kuchen and coffee...1200 yen. They served the baum kuchen with some whipped cream & apricot jam. This baum kuchen wasn't sweet, in fact it was quite dry, so the cream & jam really lifted it up. Don't know if I'll be back to Dallmayr, but I'll definitely be back to Filter & Takamura Wine. I've been wanting to try this place for some time. 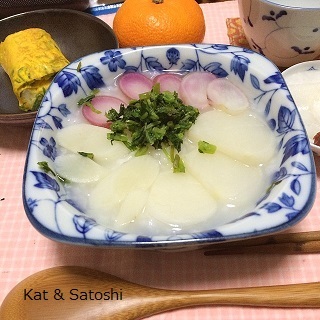 They use vegetables grown in Kyoto. I went once on a Sunday morning because I heard they serve breakfast...um, on the weekdays only (someone should update the tabelog page)...sigh. Then I thought Satoshi and I could have lunch here after his German class...their last order is at 14:00 and he usually meets up with me at 14:00...sigh. Finally, I went on a Tuesday, when I had an appointment in the area. 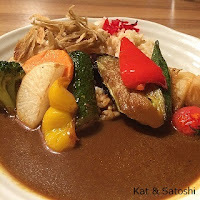 I was the first to arrive when the doors opened at 11:00 and ordered their vegetable curry...880 yen. Lots of different vegetables which were roasted or grilled and just the right amount of rice and curry. The tables filled up quite quickly, so if you plan to go, go early...I'll be back. 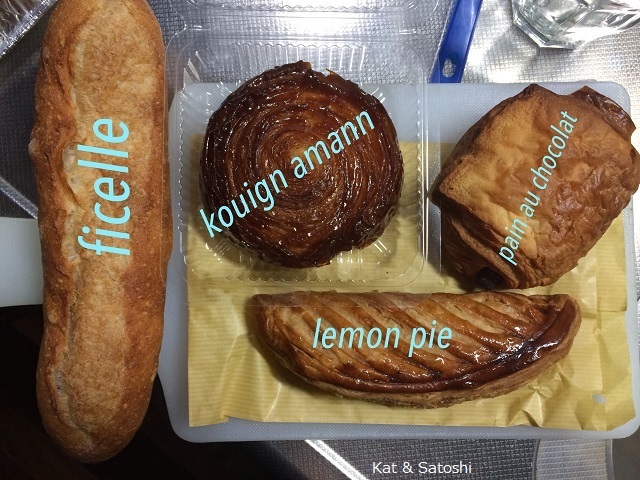 On Friday, I got a chance to meet P of FoodPorn.Osaka. He is leaving Japan at the end of the month and was nice enough to contact me to meet up. 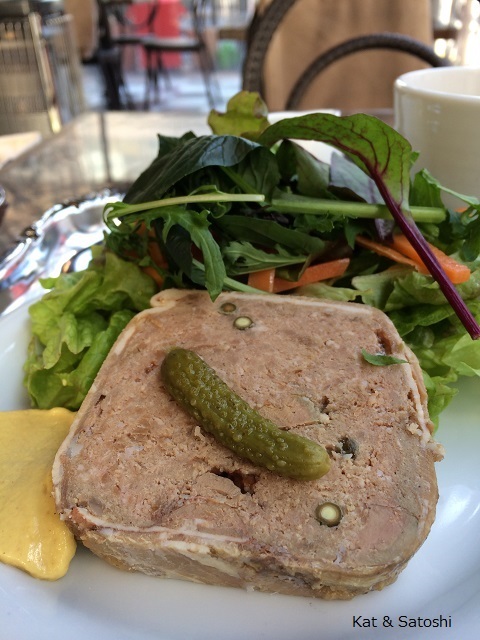 After exchanging several emails, we decided to have lunch at Il Beccafico. The restaurant has 2 seatings for lunch (12:00 & 13:00), P got their 1st seating at 12:00. The steps were very steep and narrow. 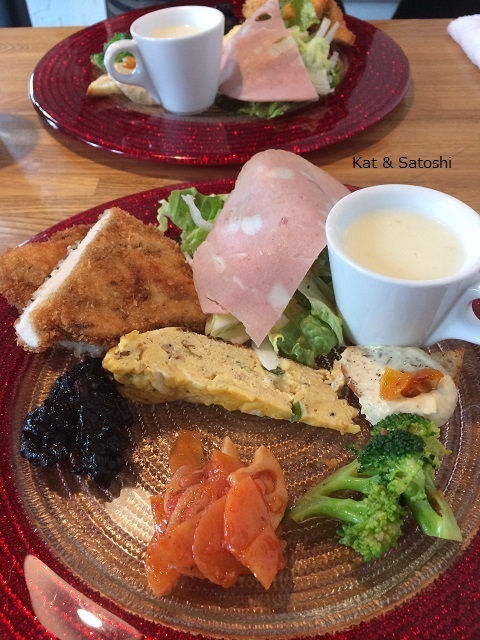 Their lunch menu is pre-set...assorted appetizers & pasta...1000 yen. 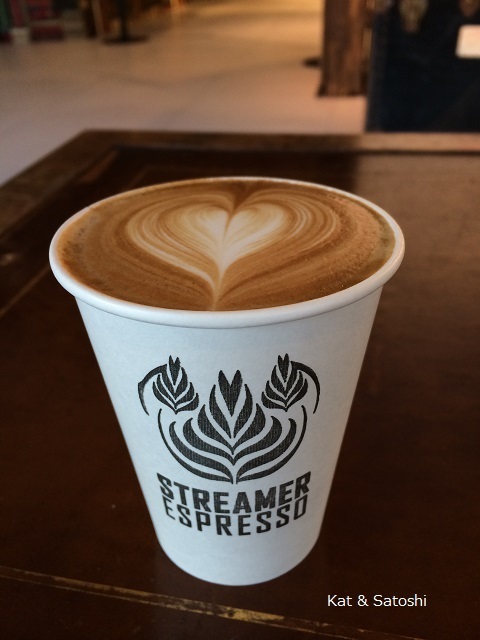 If you wanted coffee and/or dessert after lunch or a drink during lunch that would be extra. My favorite was the chicken cutlet. The breading was really crispy and had fennel seeds here and there. 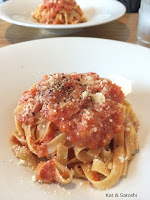 The pasta was an Amatriciana style. After lunch, we walked to one of P's favorite coffee spots in the area, Filter. It is a cozy cafe with sofas and coffee tables (like a living room), perfect for chatting or just "zoning out". 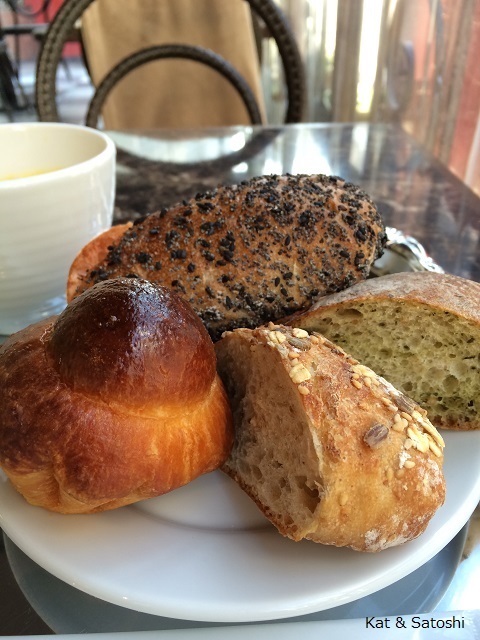 Before walking back to Umeda, we stopped into Boulangerie Takagi. I picked up these breads, which Satoshi and I had for breakfast the next day. I hope P enjoyed the ones he picked up. It was fun to finally meet P in person and talk about this and that. Thanks for a great day P! Been using this Nike sensor for 4 years?! The battery was supposedly only good for 2 years. 930-something miles later (give or take)...Thank you for keeping me motivated! Sometimes Satoshi and I like to hang out at the Itami airport. It isn't too far from where we live. 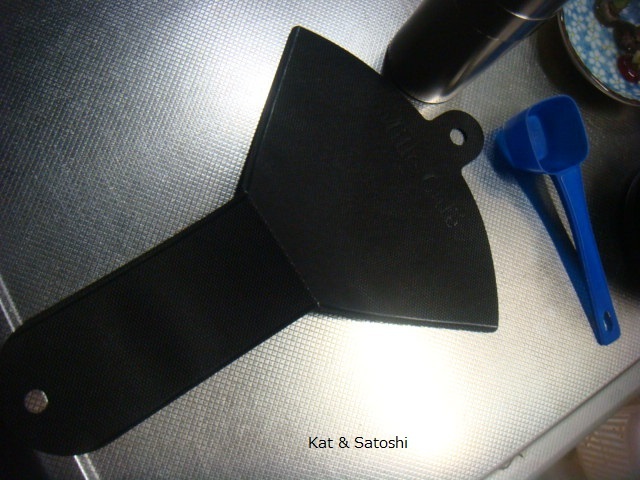 Satoshi says he likes to go there just to "feel like he's going on a vacation". Unlike most airports, this one is a great place to hang out because most of the shops and restaurants are outside of the security area. A large observation deck on the rooftop is a great place to watch the planes land and take off. There is a large interior shop which we like to ooh and aah over their furniture that will probably never fit into our apartment. And I loved this cute planter that was outside of a garden shop there too. Are you able to hang out at your airport? 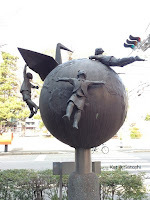 Nineteen years has passed since the Kobe Earthquake...while I'm remembering all those who lost their lives on this day, I am also looking ahead. 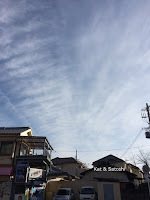 Experts are talking about the next one within the next 30 years or so...apparently they have it pinned down to winter at 18:00, but won't or can't tell us exactly what day or what year...scary! 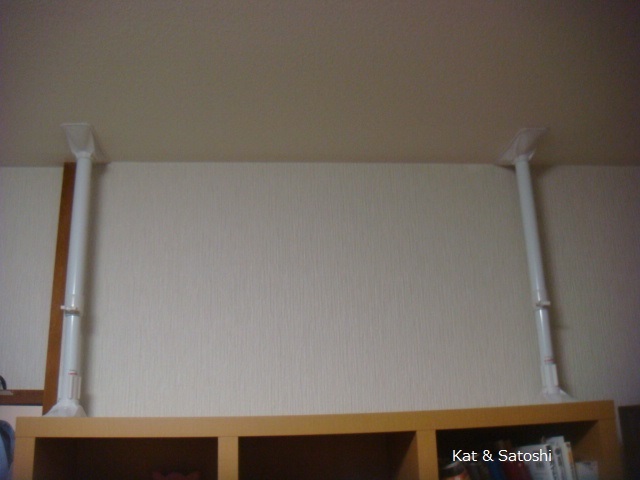 Since we have some bookshelves that may block our way out of our apartment, we put up these poles which are supposed to prevent the shelves from toppling over in the event of an earthquake. They aren't very expensive (under 2000 yen) and must be checked every so often so that the screws are tightly fastened. Sending thoughts and prayers to those in Kobe today. Yesterday was the 15th...apparently it was ichigo (strawberry) day. 15 in Japanese the number is literally ichi-go...a goro-awase (to use the sound of numbers in Japanese to make words from them) for strawberry. I actually picked up these berries over the weekend at a fruit & veggie stand, they were bigger than the berries I had seen in the markets and a little pricier, but I loved the ruby red color and they tasted sweet too. From December we start to see strawberries in the markets, they are grown in hothouses for the strawberry laden cakes at Christmas time. The price of them slowly starts dropping after the New Year. 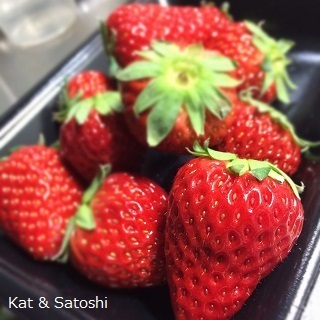 Are strawberries in season where you are? 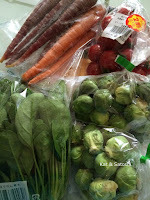 Colorful carrots, cherry tomatoes, brussels sprouts and spinach...everything is priced a little higher than in most supermarkets, but I like the variety and freshness of everything there. 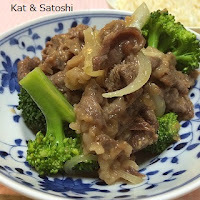 The other morning, I tried the copycat recipe for Boots & Kimo's Macadamia Nut Sauce. 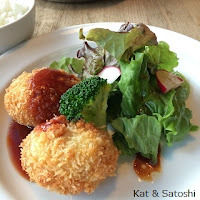 Boots & Kimo's is an eatery in Hawaii which I've written about here. 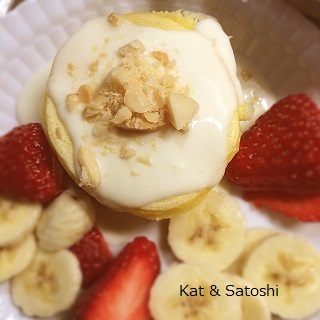 Yesterday was a holiday, I didn't want to feel frazzled in the kitchen, so I made the pancakes Sunday night and then made the sauce just before breakfast Monday morning. Finely grind nuts in food processor. Dry cook in saucepan over medium-high for 5 minutes, until fragrant. Lower heat to medium. Add butter; stir until melted. Stir in flour cook 1 minute. SLOWLY add milk and heavy cream (or half & half), CONSTANTLY whisking. Add sugar, salt, lemon juice and vanilla. Bring just to a boil (or almost to a boil, be careful) and then reduce heat just a little so that it's not boiling. Cook 5 minutes or until thickened, stirring CONSTANTLY. Serve warm. NOTES: First off, I cut this recipe to 1/4 (we don't need to be eating that much sauce). I roasted the nuts in a 150C (300F) oven for 10 minutes, then chopped them by hand, so the nuts were chunky not fine. I used full cream and skim milk, leaving out the salt and lemon juice. I did this all on low heat because I was afraid of the sauce boiling, so it took awhile before thickening. Keep your eye on this, and keep stirring. To keep the nuts crunchy, I just sprinkled some on before serving. This was delicious! Satoshi loved it too. I'm definitely making this again. Met up with Tamakikat this past Saturday. We started off by heading out to the farthest part of our adventure, Shinkokan. 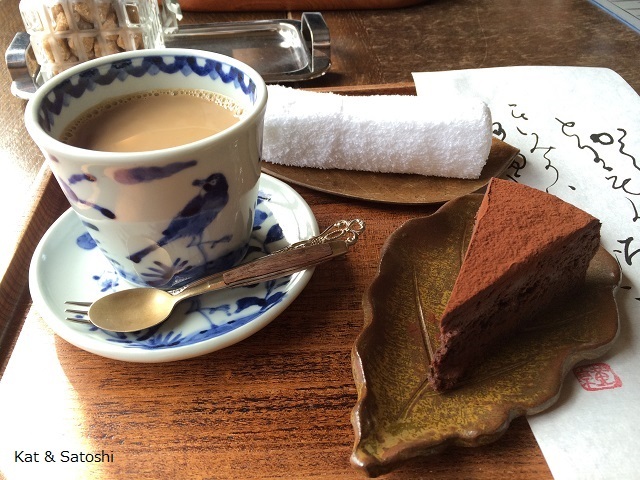 This little cafe is located on the grounds of Yoshida Sanso. The main property was the second home of an uncle of the current Emperor and is used as a ryokan (Japanese inn). 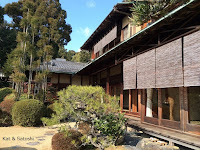 Shinkokan is located on the 2nd floor of a tiny cottage and has a nice view. We liked that we were the only ones there. We both had the chocolate cake with cafe au lait...1260 yen. 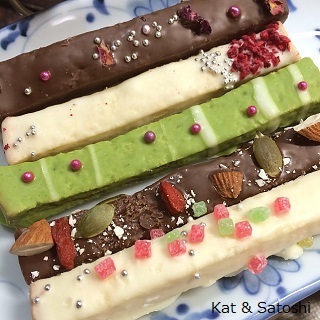 The cake is actually made with cacao mass and tofu and doesn't use eggs or dairy products. This cake was really dense, chocolatey and delicious. Loved the dishes that they served everything on too. 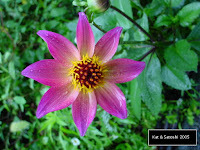 After eating, we checked out the garden, I'm sure it is even more beautiful when there are flowers and more greenery. 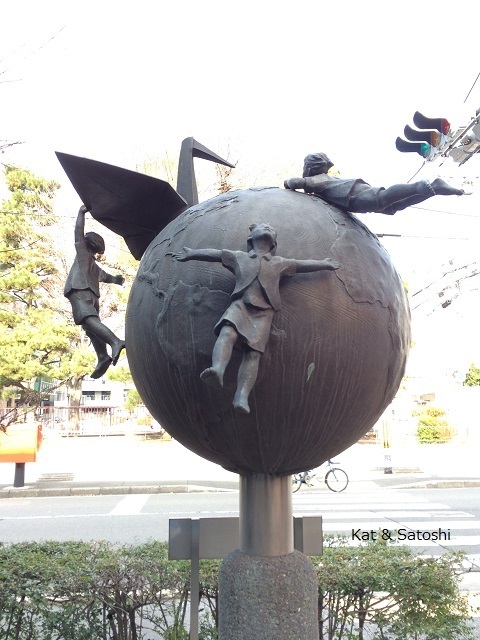 We then walked towards Kamogawa (Kamo River) and I spotted this cool objet at the entrance to the Kyoto Education Culture Center. I liked how they had origami (literally folded paper) in the shapes of crane & turtle, symbols of youth & old age. Lunch was at Kamogawa Cafe, a spacious and very comfortable place. My lunch started off with a chicken wing and kabu(turnip) soup. The meat from the chicken wings was fall off the bone tender. Super comforting chicken broth & lots of grated turnip. My main dish was an okara (soy lees) and veggie croquette...780 yen. Tamakikat had their soup set which looked delicious too. Then we checked out Wälder, a bakery near Tamakikat's place. We've actually tried to check them out a couple times previously, but they were closed each time. I'm glad they were open this time. 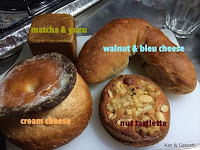 I bought a walnut bleu cheese bread (this one could've been cheesier), cream cheese filled bread (this was delicious, the bread was a french bread and the cream cheese filling was a little sweet), yuzu matcha (a teeny bread block filled with yuzu bits and matcha cream), nut tartlette (a tiny tartlette topped with lots of different nuts). Satoshi and I halved everythig and had them for Sunday breakfast...Here is a shot of the inside of the yuzu matcha block. Another great day, I'm glad we got to meet up Tamakikat! 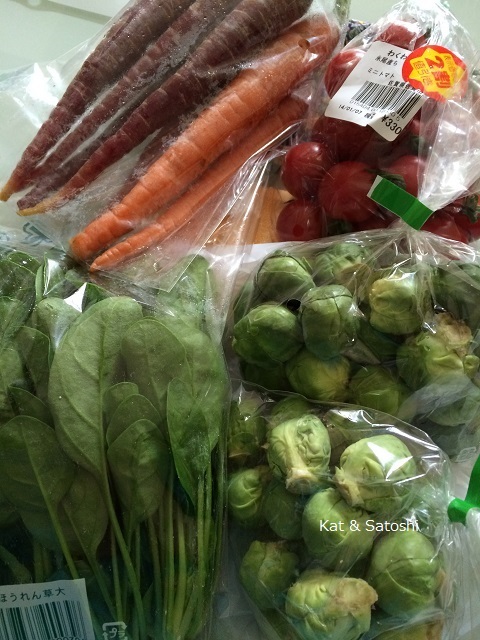 Part of a foodie care package from my host-brother's wife, Kazumi. She sent us these pretty rusks. Rusks are hard biscuits or twice baked bread...kinda like melba toast. 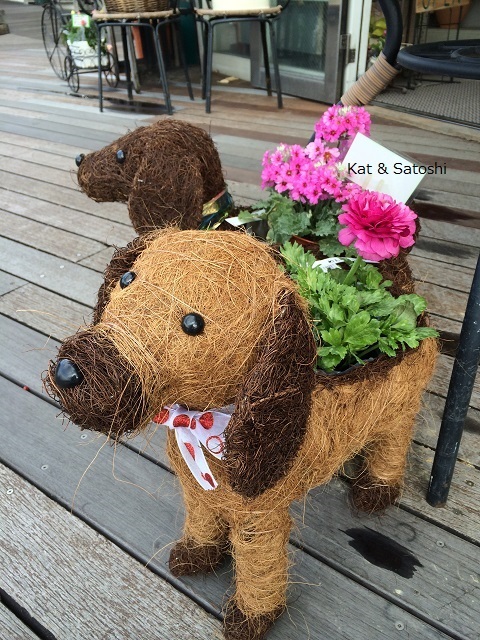 These are made by Cafe Ohzan, in Akita prefecture. They use croissant dough and bake them until they are crisp, then cover them with different chocolates and decorate them. I really liked the crispiness of these. It's definitely soup weather over here. 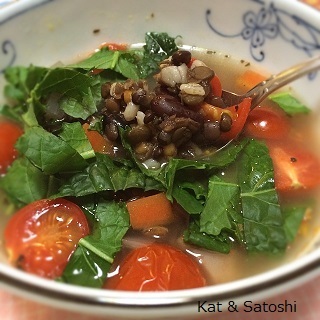 The other night I made a vegetable bean soup with veggies from my fridge (carrot, daikon), veggies from the pantry (onion, potato, dried beans), some pearl barley. And then just before serving I julienned some kale from the lanai and sliced some cherry tomatoes. Spices were an Italian seasoning blend and a consomme cube. Super simple, and a great way to warm up on an icy night. Did you know Japanese salarymen (business men) have pride? I call it "stupid pride". They refuse to wear their coats when they go out for lunch. Hands stuck deep into their pants pockets they run across the streets to eat lunch shivering all the way, no jacket on, just their dress shirts. When the temperature was changing between Fall and Winter, I suggested to Satoshi that he wear his coat to work. He said, "it's too early in the season to"...um, who said? I told him, "but if you're cold, you should wear something, otherwise you'll catch cold"
Right now, he wears thermals over his underwear, which tends to bunch up. Not very nice when wearing a suit. And then I told him about these boxers for men that have haramaki attached to them. Haramaki literally means stomach wrap. I told him, if he got a pair he wouldn't have to wear the thermals over his underwear and it wouldn't feel so bulky under his suit. Still, I dragged him over the New Years break to the store and convinced him to buy a pair. "Kat, this is the best thing ever!" It's Friday here, and a 3-day weekend. Yesterday was rainy all day long. I've always wanted to find a recipe to use the konbu (kelp) and katsuobushi (shaved bonito) after making dashi (stock)--instead of just throwing it out. 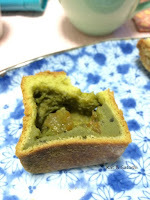 Well, I found a recipe in Masakichi's book. Super easy and relatively fast too. 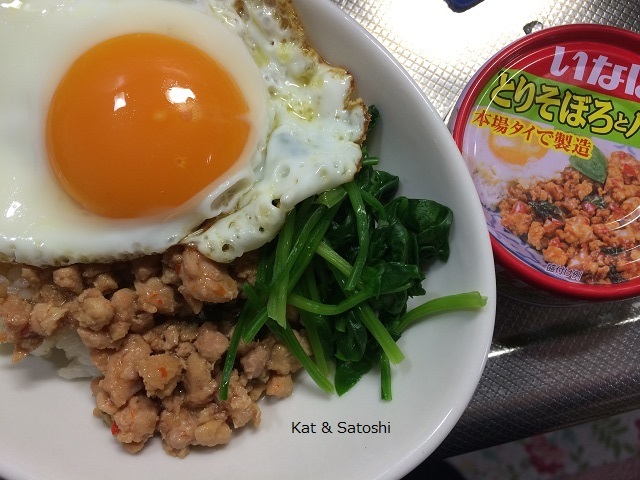 Konbu & Okaka Tsukudani adapted from "Bento no hon by Yorino Masami"
NOTES: this recipe actually calls for 2 teaspoons of kakijyoyu (kah-key-joe-you: oyster soy sauce), but I didn't have this so I just used all shoyu. For your info, kakijyoyu is a soy sauce that is infused with oyster essence. 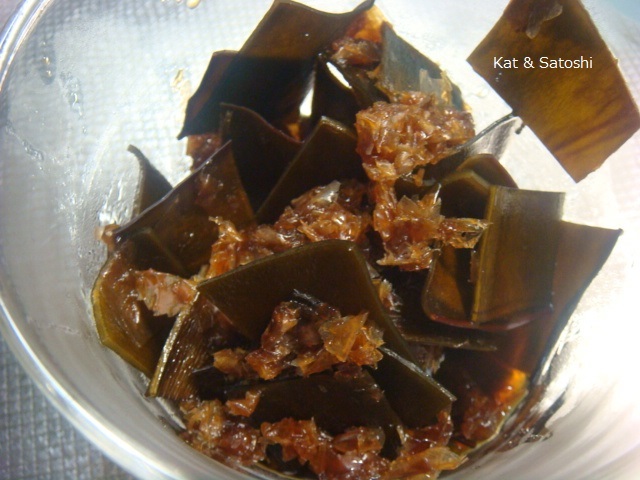 This recipe also asks that you use kelp & katsuobushi that has been used 3 times for making dashi. When making dashi, I usually don't use my konbu/katsuobushi this many times, so I just made this with kelp & katsuobushi that was used once to make dashi. The konbu was a little tough but still delicious with rice. Next time I think I'll cut the konbu into thin strips. I've told you about the ketchup-mustard squeezy thing at the convenience stores, here. 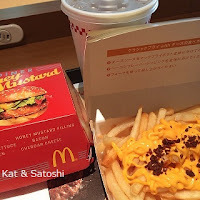 Well, the other day when I ate lunch at McDonald's, I was surprised at their cheese fries. The McDonald's here recently came out with an American Vintage Series, the sandwiches they are serving are a honey mustard chicken and a double beef burger. 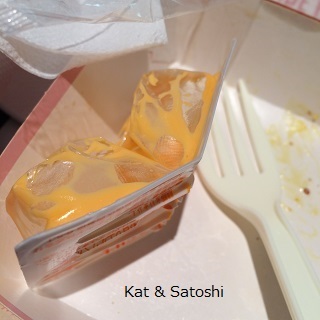 Well, the real fake cheese comes in a squeezy thing. Perfect if you are taking out because your fries won't get soggy with the goopy cheese sitting on your fries while you go back home. Is your McD's serving anything exciting? 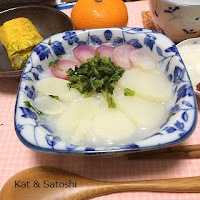 Today is the 7th of January which means we eat nanakusagayu. This year I almost forgot about making this. Luckily, when I went to the market yesterday they had the nanakusa (7-grass) sets on display. I hope this year we'll all be healthy and happy. On the 2nd, we visited MIL, she was in good spirits and was very chatty. I'm glad we got to have lunch (sushi) with her and spend some time with her. 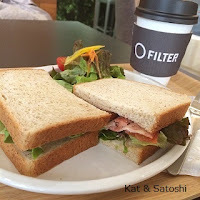 On the 3rd, the weather was nice so we went to our neighborhood cafe, Hiro, for breakfast. This is my favorite at the moment at this cafe...egg toast & salad. The bread they use for this is called "English bread". The slice is quite a long rectangle, the outside crisp, the inside is quite soft. 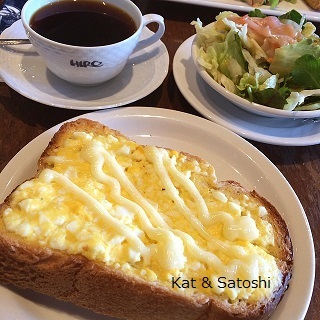 They add egg salad and toast it with a drizzle of mayo. It isn't overly goopy with mayo, just enough. This was how the skies looked on the 3rd. While walking home, we got to see a Kawasemi (common kingfisher). I had often seen posters boasting that they were around near the Minoo river, but never saw one for myself. I'm glad we got a glimpse at one, they are quite teeny! and fast! That night we had pizza. 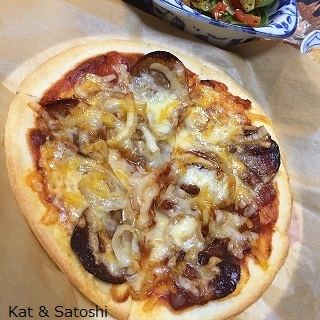 We bought the crust and I topped it with salami and lots of onion and cheese. Before baking the pizza, I sauteed the onions and salami...so good! On the 4th, the weather was cold but tolerable. 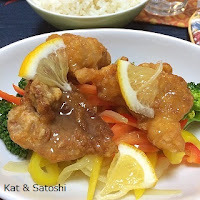 For dinner we had lemon chicken using my recipe for lemon sauce. 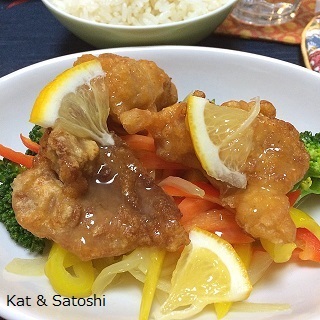 I used pre-made karaage (fried chicken) and served it on some broccoli, red bell pepper, yellow bell pepper, carrots & onions sauteed in olive oil. Yesterday the wind was icy and it was overcast for most of the day. I wished it would snow or at least have flurries but Mother Nature wasn't listening to me. For dinner we had beef broccoli. Can you believe it was the first time I've ever made this? I found a pretty easy recipe in "Hawaii's Best Local Dishes" by Janet Watanabe Hee. I steamed my broccoli and set it aside. NOTES: these measurements for the marinade are for 1 pound of meat and 2 pounds of broccoli and is supposed to serve 4. I think I either marinated the meat too long (6 hours) or using whiskey was too strong or the amount of marinade was too strong for the amount of meat and broccoli I had because it tasted a bit boozy. Before I cooked the meat, I sauteed some thinly sliced onion in some sesame oil, then added the meat to cook. Since the meat was quite thick from the flour I kept adding water to keep things "loose". Then I added the broccoli at the end just to heat through. I would make this again but cut back the marinade to half. So that's what we've been up to the past couple of days, how is your 2014 going so far?